Atul Kochhar has quite simply re-invented Indian cuisine. His unique talent as a twice Michelin Starred Chef has changed the way people perceive and experience Indian food – the very first Indian Chef to receive a Michelin Star during his time at Tamarind. He then went on to create the world renowned Benares Restaurant where his creative talents did not go unmissed and he went on to win his second Michelin Star in 2007. His incredible ability to create such unique and rare dishes from all parts of the world has formed the highly successful Benares Restaurant. 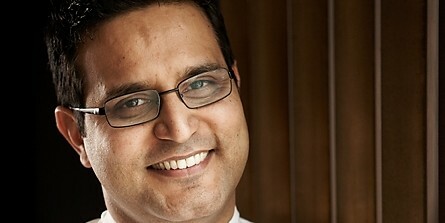 Atul started his cooking career at The Oberoi group of hotels in India. In June 1993 he graduated to the five star deluxe Oberoi Hotel in New Delhi. Here Atul worked as a Sous Chef in one of the five restaurants in the hotel. Atul then moved to the fine dining restaurant of Bernard Kunig. In November 1994, Atul moved to London to open Tamarind and in January 2001, he was awarded his first Michelin star. This saw Atul publish the follow up to his hugely successful debut recipe book Indian Essence. In Fish, Indian Style, Atul presents recipes using every variety of fish, spiced in the Indian style for which he is so renowned for. Atul is also currently in the process of writing his third and due to be his most outstanding book to date: ‘Curries of The World’, due to be published in 2012. Atul also opened Ananda in October 2008 – meaning eternal joy –, which is situated in the Dundrum Town Centre on the beautiful outskirts of Dublin.